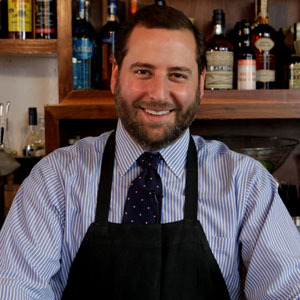 Neal Bodenheimer is a master mixologist and co-owner/founder of three award-winning bars in his hometown of New Orleans: Cure, Belloq, and Cane & Table. Bodenheimer got his bartending start at The Atlantic Grill in New York City. There the passion for well-crafted cocktails he cultivated as a young traveler grew into surety that this would be his career. In 2006, with experience in tow, Bodenheimer returned to New Orleans, built a partnership with Matthew Kohnke and Kirk Estonpinal and in 2009, opened Cure on Freret Street. In addition to receiving overwhelming acclaim, Cure helped to spur development in what once was an unfavorable neighborhood; Freret is now a thriving, go-to area, and Cure is one of its mainstays. Among the teams' most recent successes are the openings of Bellocq in the Warehouse District and Cane & Table in the French Quarter, both of which opened to rave reviews. Cane & Table was named among the 8 Best Southern Cocktail Bars by Conde Nast Traveler, and both Cure and Cane & Table were featured as Top Bars in New Orleans by Travel + Leisure. Bodenheimer’s New Orleans cocktail preservationist spirit inspires the creativity that has earned him features in Food & Wine, and a Best Bar award by Esquire. Bodenheimer is currently a 2015 James Beard Foundation Award semifinalist. Adding salt or sugar to the outside of a cocktail glass can accentuate the flavors of the drink inside the glass, and elevate the overall drinking experience. This version of the Pisco Sour adds wine for a light, tasty twist on the original. Egg foam adds a uniquely fluffy texture to cocktails, and helps tone down strong flavors.